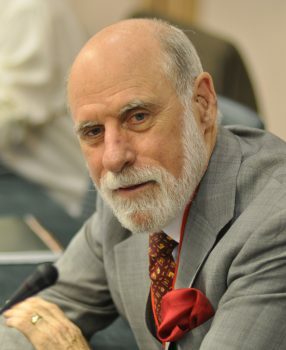 Vinton Cerf is often named one of the ‘fathers of the internet’: He developed many things we use everyday, usually without thinking about it, like the TCP/IP internet protocol that identifies who is sending what to whom on the net. The IP address that every web-enabled device has is a result of this protocol. Another example: In the mid-1980s, Cerf convinced the US government to allow a commercial email service to use the ‘internet’ that had been previously reserved for US government agencies and organizations, plus some universities. Cerf, who had been MCI’s vice president from 1982 to 1986, succeeded, and MCI mail became one of the first commercial email services on the internet – soon other private email services wanted to join as well. 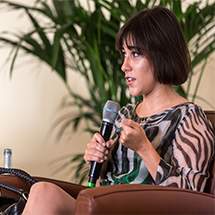 “Whereas in the past, you couldn’t talk across the different systems, now they were interconnected to each other,” Cerf explains, so people could suddenly communicate across provider barriers – you know the rest of the story. Since 2005, Cerf is Google vice president and its ‘Chief Internet Evangelist’. On his first day in this new role, Cerf showed up at the Google offices in the rather priestly looking academic dress of the Spanish Balearic Islands, illustrating his new title and joking about it at the same time. “People over forty got the joke and laughed, but the younger ones didn’t get it, some didn’t dare look at me, and when I tried to introduce myself, they even backed away,” he tells in a 2009 video. “I raised the average age considerably by joining Google,” he comments. The more Cerf lectures I hear, the more I’m impressed by his dry sense of humour: it seems as if something that was so new and changed our world so profoundly as the internet had to be invented by someone who has a sixth sense for the unexpected – also the hallmark of a great comedian. Already as a graduate student at UCLA in the late 1960s, Cerf was working on the problem of connecting several computers in a network. This UCLA group anticipated a communication method that was quite different from the telephone, where a ‘line’ has to remain open for the entire conversation, this is called ‘circuit switching’. In contrast, connected computers send small data packets that are more like electronic postcards, this is called ‘packet switching’. Cerf wrote a program that enabled four computers to communicate in this fashion in a ‘four node network’. In 1973, he and his colleague Robert Kahn wrote the TCP/IP protocol that is the prevalent protocol of today’s internet within only six months. Together they received the 2004 Turing Award for this invention. 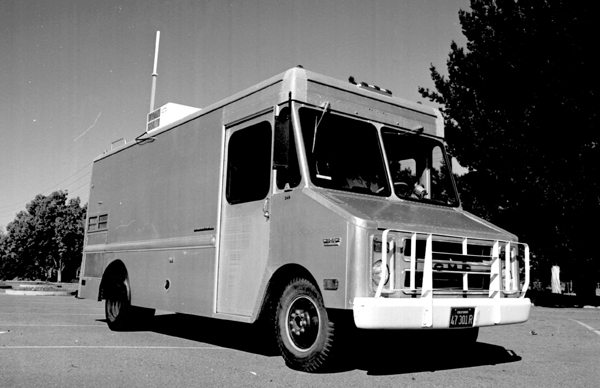 Truck for the 1977 three network test: a Stanford Research Institute’s Packet Radio Van was one network of the first ‘three-way internetwork transmission’. Cerf had been an assistant professor at Stanford until 1976. Photo: SRI International, CC BY-SA 3.0. Working on the ARPANET for the Defense Advanced Research Project Agency DARPA in 1977, Cerf and his colleagues launched an impressive test by sending a data packet over more than 100,000 miles through different networks: via radio from a moving truck, via satellite and landline, and back. “We were jumping up and down screaming, ‘It works! It works!’,” as Cerf remembers, “Hey, it’s software, and it’s a miracle if software is working!” Before this large-scale experiment, the experts had a year-long discussion about the size of IP addresses. Finally Cerf said: “Okay, it’s only an experiment, so over 4 billion possible addresses should be enough.” Well, the same protocol, now known as IPv4, is still being used today, but addresses were running low, so Ipv6 with 128-bit addresses instead of 32-bit was introduced after the year 2000. You see: these protocols are not cast in stone. They can be changed according to the users’ needs and demands. In 1998, Vint started working with the NASA’s Jet Propulsion Laboratory with the goal to find a novel communication path for missions to Mars, an internet in the sky. Originally, the TCP/IP protocol was supposed to be used, but a radio signal to Mars can take up to 20 minutes, so “the flow control methods of TCP don’t work”. The distances, and thus the delays, are just too large, and the fact that planets rotate makes it even harder to communicate with something on a planet’s surface. So Vinton Cerf, the internet pioneer, invented a new communication protocol for space, the ‘delay-tolerand networking’ DTN; DARPA and NASA also call it ‘disruption-tolerant networking’. Cerf’s dream is to use veteran spacecrafts that have completed their missions, but still retain sensors, computers and memory, as nodes for an interplanetary internet, the InterPlaNet: space ships and probes are supposed to provide the ‘backbone’ for an interplanetary web, and they would also be compatible with each other and could work together easily. Some space buffs might ask: Why does anyone need an additional communication in space when the current systems are working just fine (most of the time)? 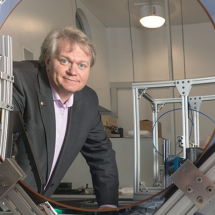 Cerf is already one step ahead: When spacecrafts will travel far beyond the solar system one day, maybe with the help of ion engines, they will need new forms of communication, and the InterPlaNet may be just the right thing at the right place to receive their femtosecond laser messages. DTN has already been successfully tested in space, with a three node network consisting of the ISS, the spacecraft EPOXI, formerly known as the Deep Impact Mission, and one terrestrial node. Other than TCP/IP, DTN works with the ‘store and forward’ method: each data packet is stored at each relay until connectivity is restored; this is also called ‘bundle protocol’, or simply ‘bundling’. 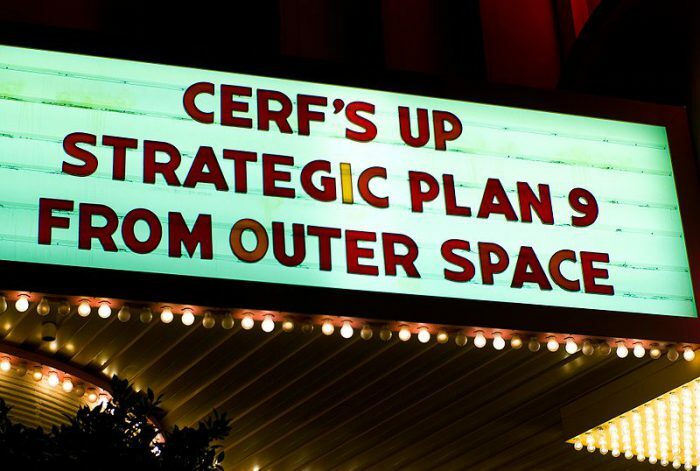 Currently Cerf is working with the Consultative Committee on Space Data Systems CCSDS to make sure that future spacecrafts will be built to the standards needed to upload DTN. 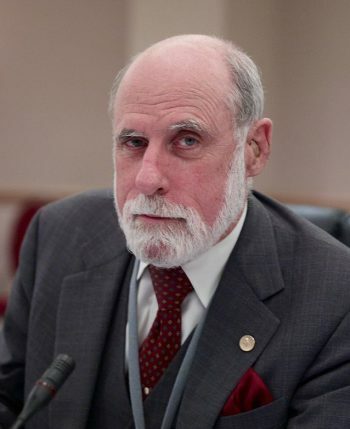 On Earth, Vinton Cerf is one of the strong proponents of net neutrality. And he’s not solely concerned about internet censorship, but also about monopolistic structures, like broadband providers that slow down the competitors’ data flow. He’s active in many internet organizations, for instance he co-founded ICANN, a nonprofit organization that coordinates the namespaces of the internet. 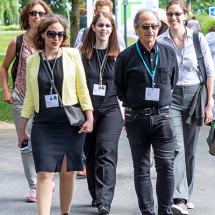 In 2014, Cerf gave a lecture at the Heidelberg Laureate Forum, where laureates from mathematics and computer science meet young scientists. Both meetings in Lindau and Heidelberg cooperate closely, and this is why Vinton Cerf will give the very first Heidelberg Lecture in Lindau on June 29, 2016 with the title ‘The Origins and Evolution of the Internet’. We’re looking forward to his lecture, to the unexpected – and to his dry jokes. A video of this lecture will be posted soon after the 66th Lindau Nobel Laureate Meeting in the mediatheque.